Chesed Direct’s expertise in choosing the right media for a given product is a must in the world of Direct Response. Even the best products and commercials need the right media venues to successfully market a product. This is why we pride ourselves in our team of expert media buyers who make sure that every dollar spent on advertising is maximized by choosing the best media for your product. Costly as advertising is, we make every penny worthwhile selling literally millions of units via traditional media and online. Chesed Direct handles all areas of fulfillment and customer service so our clients and inventors don’t have to worry about a thing. All aspects of the actual sale, including: inbound telemarketing, warehousing, credit card processing, shipping product and, of course, customer service, are handled by our highly trained team to ensure that the process is executed as smoothly as possible giving our customers a pleasant purchase experience. With a successful Direct Response campaign, Chesed Direct’s work still does not end. 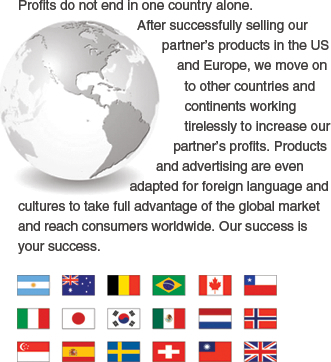 We move on to increase our partner’s profits by promoting their products in retail as well. Many of our partner’s products are carried by famous chain stores such as CVS, Walmart, Bed, Bath & Beyond and more. Your product can too!